Last year, Vince Sheehy, president of Sheehy Auto Stores, presented the American Heart Association's Allie Cohen with a donation of more than $200,000 raised during the Sheehy 6000 sales event. 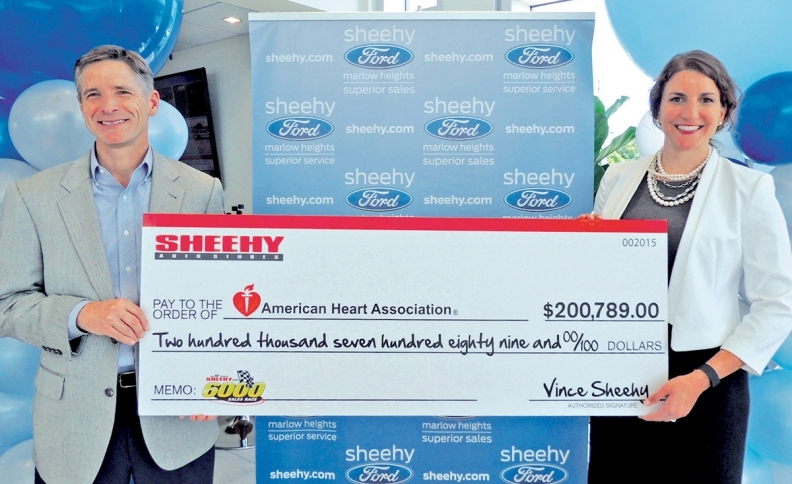 Sheehy Auto Stores' Sheehy 7000 sales promotion, running through July 5, aims to sell 7,000 cars over 50 days, with each sale generating a contribution to the American Heart Association. 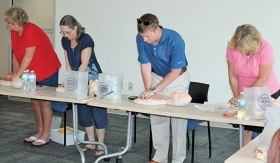 CPR demonstrations for employees are part of Sheehy's partnership with the heart association. Walk into any of Sheehy Auto Stores' 23 outlets in Maryland and Virginia, and you'll find heart-healthy eating tips to go along with their nine brands of cars and Harley-Davidson motorcycles. Or you might come upon a demonstration of CPR or one for exercise strategies for desk-bound workers or a workshop on how to read food labels for such things as unhealthy levels of sodium, sugar or other ingredients. All that is part of a partnership between Sheehy and the American Heart Association that has several goals, including charitable giving, educational outreach and, oh, selling 7,000 vehicles in 50 days from mid-May to early July. The heart-health program is one of many charitable activities at the family-owned dealership group, which estimates that its efforts have raised more than $40 million for community and nonprofit organizations over its 50-year history. Charitable giving, said Allison Centore, director of marketing for the dealership group, has been part of the brand "starting from the very beginning, starting from day one of year one." The cornerstone of that effort, going on through July 5, is the Sheehy 7000 sales event, which generates a donation to the heart association for each vehicle sold, with a guarantee of $150,000, Centore said. The total amount could go higher, since last year's 6,000-unit promotion resulted in a contribution of more than $200,000. "Everything that we do is designed to generate funds for the American Heart Association," she said. "To do that, we need to sell the cars, but we also take donations from anybody -- from our vendors and our customers" even if they don't buy a car. Sheehy uses its charitable activities in its marketing efforts on broadcast TV and radio and in direct-mail and digital advertising, driving home a message that resonates with potential customers. "We're more than just a dealership," Centore said. "We're there to serve the community whenever we can." Sheehy Auto Stores is No. 33 on Automotive News' list of the top 150 dealership groups based in the U.S. with retail sales of 22,987 new vehicles in 2015. Other service-oriented events include dog-adoption days at its dealerships, including the Subaru and Lexus stores. Rescue groups "bring animals in, and customers or anyone can come by and see the animals, interact with them and adopt them right there on the spot," Centore said. At Thanksgiving, food banks are the focus of giving by the dealerships; at Christmas, it's Toys for Tots. And each dealership picks a favorite charity for a significant contribution at year end, Centore said. Michelle Nostheide, vice president of marketing and communications at the American Heart Association, said her group sees the opportunity as one of outreach, both to the larger community and dealership employees. Lots of them spend long hours sitting in front of a desk and are prime customers for the heart association's demonstrations on exercises that can be done in the office and diet tips. "It's important to us that they feel that they are benefiting from the partnership," she said. Centore said there's more to come as Sheehy seeks new ways to reach out to the community and sell cars in the process. "We get creative," she said. "And it's fun."